“I love you Pathos, Pathos!,” a girl screams as the band walks out and begins setting up their instruments. “I love you Pathos, Pathos,” a girl screamed as the band walks out and begins setting up their instruments. The whole crowd cheered, and lead singer Matt Walsh looked up and smiled as he tuned his guitar. The crowd grew larger and larger until almost all the space in the venue was full. There was excitement in the air. This was the kickoff to Pathos, Pathos’ national tour. Spacebar is a very unique venue, with graffiti covered walls and disco lights that hang from the ceiling. Everybody was bathed in blue light that radiated from a light overhead. Pathos, Pathos launched into their first song and the energy was infectious. People in the audience were dancing and moving to the beat as senior event management major James Murphy played drums and senior economics major Frank Palencia played guitar. Walsh launched into his song, his expansive falsetto voice floating overhead and out into the crowd. After the first song, Walsh thanked the crowd for coming out. Everyone responded encouragingly, whooping and cheering. After months of work, the crowd was excited to hear the payoff. Pathos, Pathos will be doing 22 shows from July 8 to Aug. 6. They kicked off their national tour on Friday, July 8, at the Spacebar in Orlando’s Milk District. They will make several stops in Florida before heading north and playing in cities such as New York, Philadelphia and Richmond. Walsh, a senior economics major, formed the band with Palencia after meeting him while they worked at Starbucks. 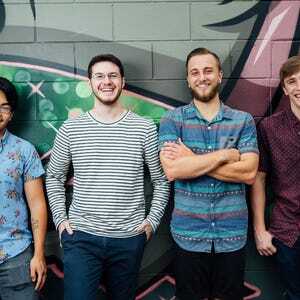 Since the inception of the band, Pathos, Pathos has become a fan favorite within the UCF community and the Orlando indie rock community. In addition to Walsh and Palencia, the band is comprised of Murphy and Charles Woody, who plays bass. The tour will promote the release of the band’s second EP.. Titled Pet Names, it features songs that are perfect for fans of The Spinto Band or Death Cab for Cutie. Lead singer Walsh wrote all five songs on the EP. “Usually, I’ll write the core of the song, and then we write parts and add to it little by little ,and it comes together like that,” Walsh said. This EP has been years in the making. Pathos, Pathos recorded the EP at the Parafonic Recording Studio in Orlando. They didn’t record the EP all at once. The whole process of recording the songs and creating the EP began in October of last year. It was officially finished this May. “We would take like a week to record some things and then, after a few weeks, we would come back to it,” Palencia said. The process for booking the venues was a laborious one. “Basically, you just email the venue and pitch yourself to them. Once you book a venue, you reach out to bands in that area. It’s a lot of stress and last-minute work, but it all comes together in the end, ” Walsh said. “Last tour, we stayed at one hotel and that was it,” Murphy said. The band couch surfed and stayed with friends and family. Now the culmination of all the work is this: the kickoff show. Walsh started singing his first song and the crowd cheered, ready to hear the the result of all those months of writing and recording.